Sega combines one of its best franchises with Peggle. Pachinko style games have become popular since Peggle burst onto the scene. That said, Sega hopes to cash in on the craze by using one of its classic franchises with Peggle style gameplay. In Super Monkey Ball Bounce, you take control of AiAi as you try to save your friends from Professor Boscis. It's a pachinko style game where you shoot the monkeys at various targets. As you save your friends, you can use them in the puzzles as well. Each of the monkeys has different skills that prove useful in the different puzzles and getting the highest scores possible. This helps differentiate the game from other pachinko style efforts. In addition, there are power ups you can use to help with the puzzles. Super Monkey Ball Bounce has ads after every level, which disrupts the experience. The game also pushes a lot of freemium content on the player. Everything works on a life system, so if you fail a level you lose a life. If you lose four lives you have to wait until they regenerate or pay to keep playing. Even the power-ups cost money, though to be fair, they are not essential to making progress in the game. 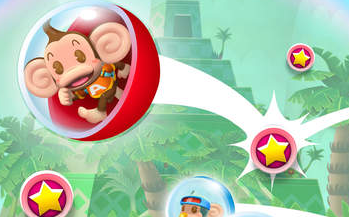 While not a true sequel, Super Monkey Ball Bounce will provide several hours of fun. Since it's free, all Monkey Ball fans should give it a serious look. Download Super Monkey Ball Bounce for iPhone, iPad and Android.